A Thought Experiment: HABITATS CAN CYCLE FORWARD TO MARS "MARSONANCE". Above diagram shows a notional habitat orbit as it intercepts orbits of Earth and Mars. (Spinning habitat is designed to simulate gravity via centrifugal force.) Above object's orbit has same period as Mars; thus, a fortuitous resonance could enable a habitat to rendezvous with Mars every 1.88 years. 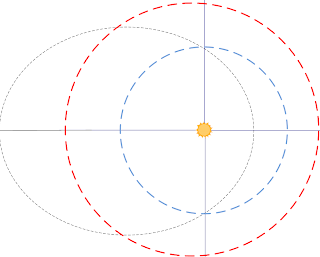 This orbit is designed with a perihelion (q, closest point to Sol) of 1.0 AU, radius of Earth's solar orbit. If habitat adapts this orbit, q is the position to effect a periodic rendezvous for Habitat to exchange passengers and cargo with Earth bound enterprises. Unfortunately, Earth rendezvous opportunities would be rare for above orbit. Since the orbital period (1.88 years) is same as Mars's orbit (1.88) but not Earth's period (1 year), it resonates with Mars but not with Earth. Consider orbits with Mars's resonance. and orbit could be modified for continuous habitat transfer between planets. For any orbit, perihelion (q) can be any nonzero value up to a max of a, semimajor axis. Thus, "q" can be expressed as percent of semimajor axis (%a) and/or Astro-Units (AU). thus, a habitat cannot use this orbit to transfer from Earth orbit to Mars orbit. but it's very unlikely that Habitat will actually rendezvous with Earth at time of intercept. this increases frequency of actual rendezvous event with Habitat and Earth. Flatter orbit enables "transfers" between planet orbits. 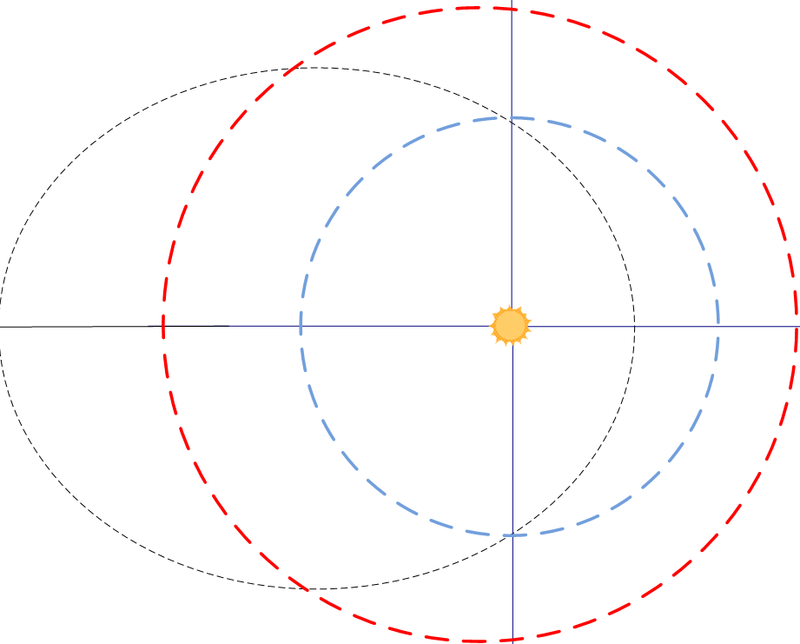 For simplicity, assume all three orbits to be coplanar; inclination is considered later. Most Solar objects orbit in a counter clockwise (CCW) direction as observed from north of the Earth. Most solar objects use a reference ray at orbit's perihelion, q. Thus, Habitat's angular distance (Θ) is 0° at q, and increases in a CCW direction. Arbitrarily design Habitat's orbit so q happens at 40° behind Earth and 69° behind Mars. This arrangement enables Habitat to rendezvous with Earth 51 days after q; 67 days after Earth, it could rendezvous with Mars. IT TURNS OUT that such a rendezvous would be rare for Earth, because this same configuration would seldom repeat. However, orbital resonance enables Habitat to rendezvous with Mars at same position for every orbital cycle. Above orbital elements can be observed for Earth and Mars. TE assumes that humanity will someday deploy a Habitat in an orbit designed for optimal, periodic transport between Earth and Mars. Thus, Habitat's orbital elements were chosen, including first two angular positions: Θ0 and Θ1 . Angular positions for Earth and Mars are determined in following tables/diagrams. Habitat velocities range from over 47 kilometers per second (kps) to a low of 12.33 kps. 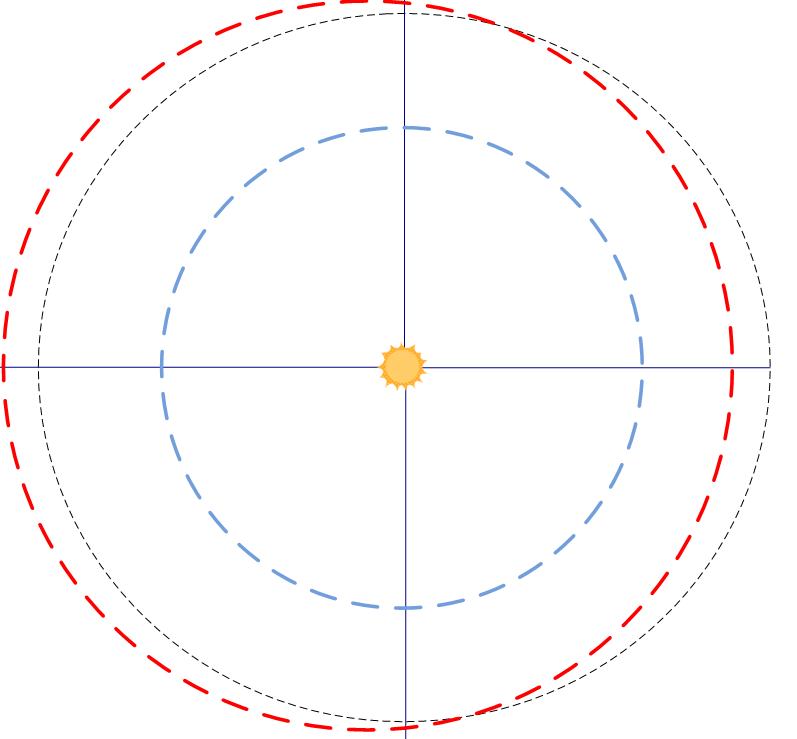 ① At Θ = 0°, diagram shows Habitat's semi-orbit at nearest point to Sol, perihelion (q). This particular semi-orbit has Earth leading habitat by 40.16° and Mars leading by 68.60°. ② At Θ = 45°, all three objects (Habitat, Earth, Mars) have advanced, but the fast moving Habitat has gained on the other two. ③ At Θ = 90°, Habitat will cross orbit of Earth, because Habitat's orbit is designed that way. Diagrams shows a rendezvous with Earth for this particular orbit; unfortunately, Habitat orbit does not resonate with orbit of Earth, and this fortuitous event will be relatively rare. Fortunately, travelers will use "parking orbits (described later) to complete most transits to/from Earth. ④ At Θ = 129°, Habitat completes rendezvous with Mars. Since Habitat's orbit is designed with same period (T) as orbit of Mars, Habitat will rendezvous with Mars in same position for subsequent orbits; thus, travelers can count on this Habitat for consistent transport to/fm Mars. 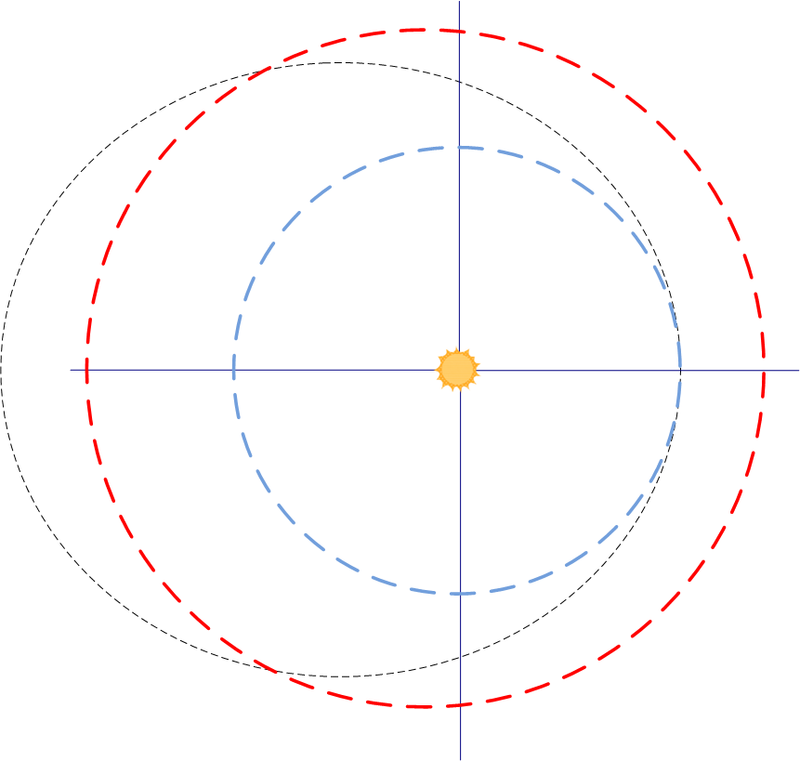 ⑤ At Θ = 180°, Habitat's semi-orbit is at farthest point from Sol, perihelion (Q). 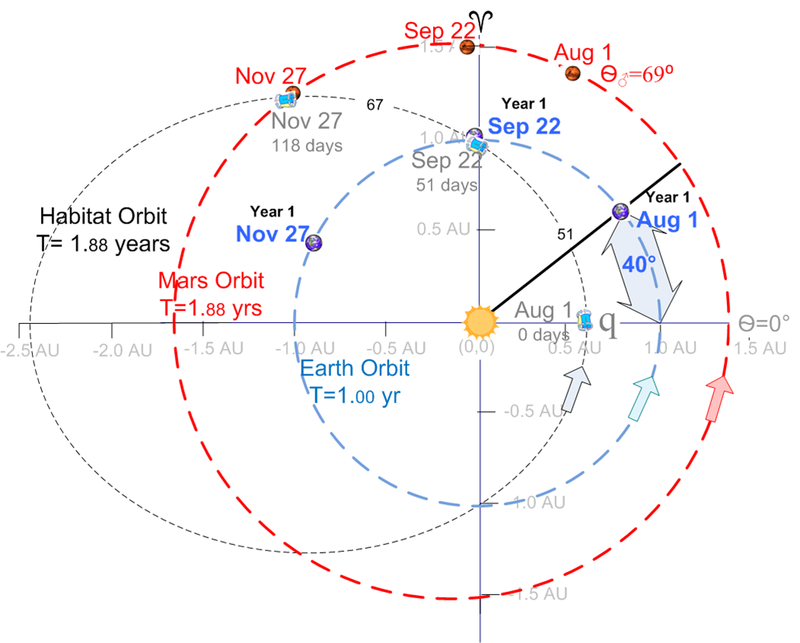 Mars is far away, and Earth has almost completed a full orbit (almost a year) since the first position on the diagram. Ang. Pos. Radius X-Coord Y-Coord Incr. Distance Ave. Velocity Incr. Time Ang. Pos. Ang. Pos. Radius readily computed from Sol to Habitat; then, translate into 2 Dimensional (X.Y) coordinates. Pythagorean Theorem helps determine incremental distances between selected pairs of positions. Determine average velocity for each positional pair; divide distance by VAve for approximate travel times. 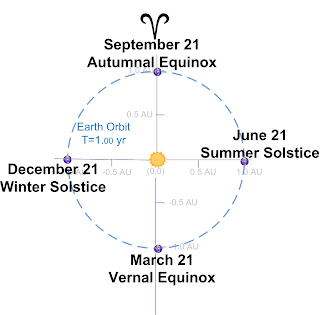 this event is commonly known as the Vernal Equinox. Throughout each year, date indicates position. 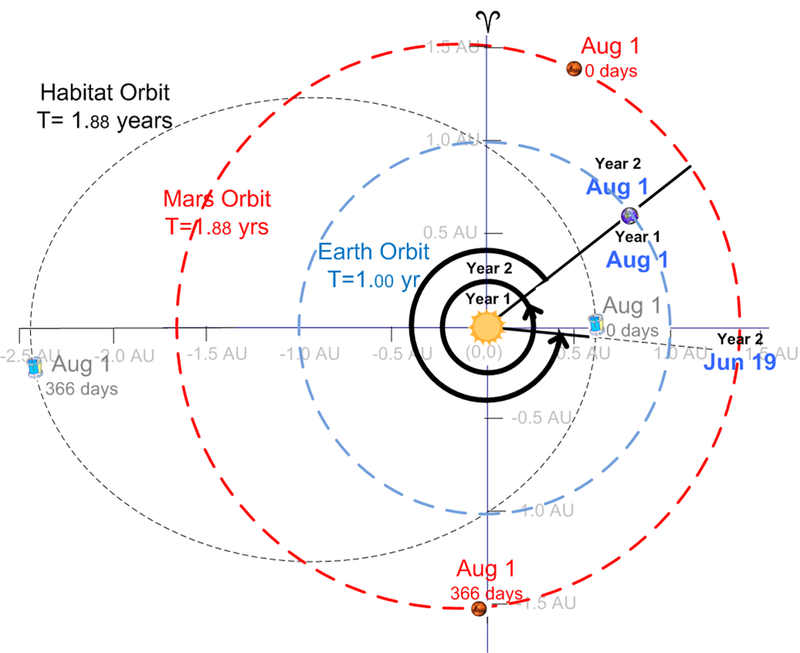 Design Habitat orbit to have same semimajor axis as orbit of Mars; thus, both share same orbital period (1.88 year) which exceeds Earth's orbital period (1 year). Thus, Earth will repeat much of its orbit while Mars and Habitat complete their respective orbits. Thus, using Earth dates to track progress of Habitat can result in ambiguities. Clarify by labeling Earth positions with both date and year. 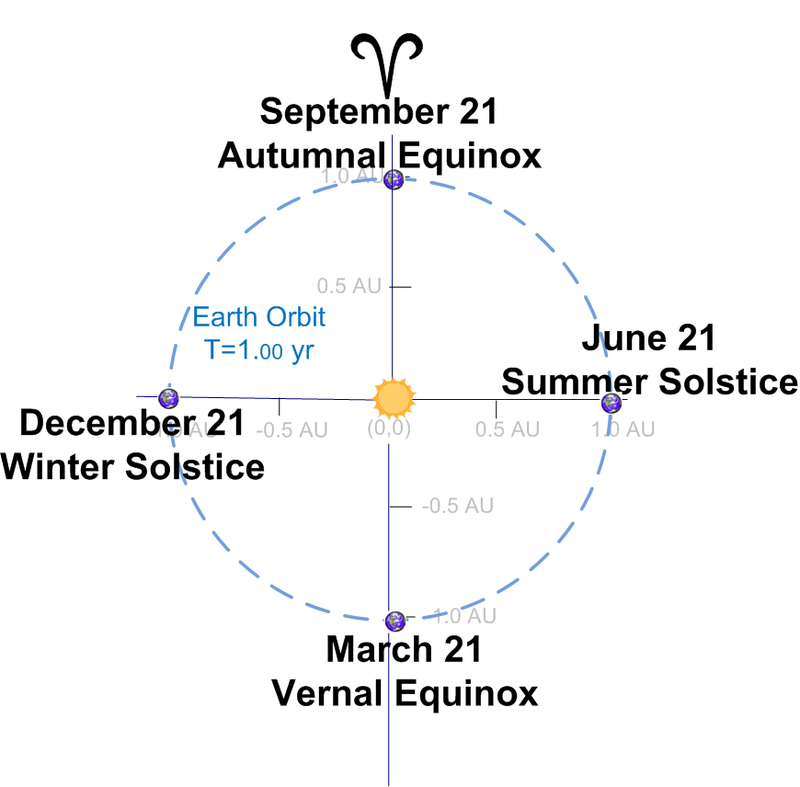 However, positions of Mars/Habitat are not ambiguous; thus, they can be clearly marked with Earth date and days of travel (time since Habitat's perihelion, q). Reference Ray (Θ =0°) extends from Sol to q, Habitat's perihelion. Earth leads Habitat by about 40°. Since Habitat is closer to Sol and quicker in this part of the orbit, it intercepts Earth in 51 days. Mars leads by approximately 69°. Habitat intercepts Mars after 116 days since it passes q. 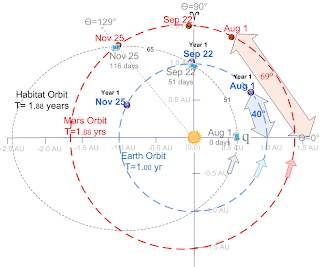 Since Habitat orbit has same period as Mars, Mars's lead angle repeats for subsequent orbits. Unfortunately, lead angle of Earth cannot readily repeat. 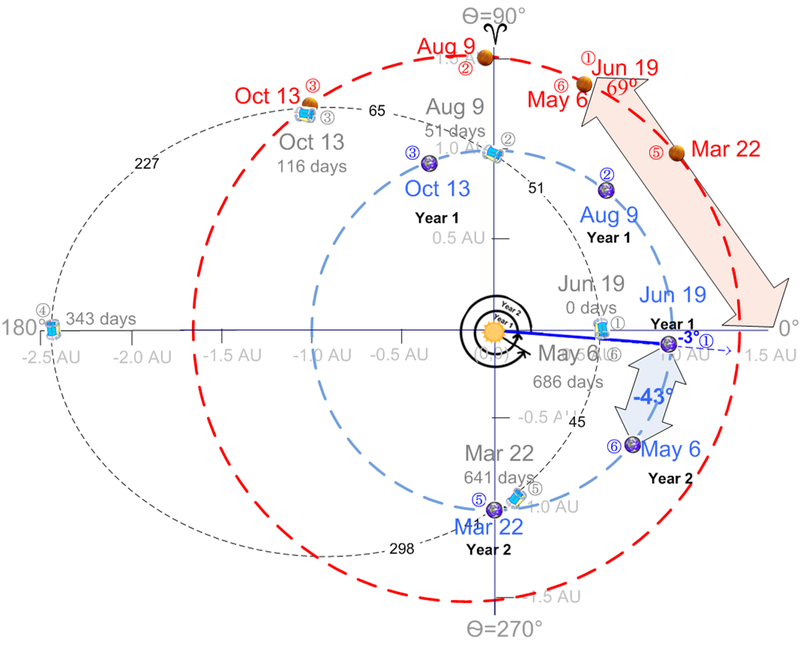 ② 1st Intercept: 116 days after q (Θ=0°), Habitat will rendezvous with Mars. ③ Habitat's position at 231 days is Θ=159° after q. ④ Aphelion. 345 days (Θ=180°) into orbit, Habitat reaches farthest point from Sol, also the orbit's slowest point. ⑤ Habitat's position at459 days ; Θ=201° past q. ⑥ 2nd Intercept: 574 days (Θ=231°), Habitat again intercepts orbit of Mars; however, Mars, the planet, is far away and out of sight. Since Habitat orbit has same period as Mars orbit, Habitat will continue Mars intercepts for future orbits. These will occur at same angle (129°) and same travel time (116 days since q). Consider Earth Intercepts During First Orbit. 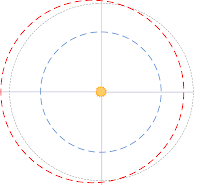 Traditionally, q, orbit's perihelion, is an orbit's starting point. 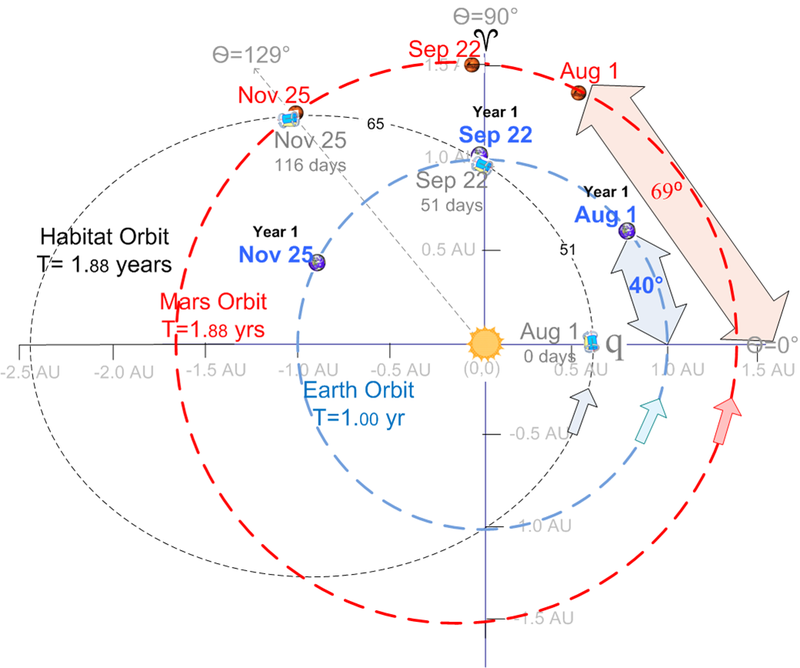 For the first orbit, we arbitrarily start this orbit at August 1, which puts Earth leading Habitat by 40°. Furthermore, we arbitrarily place Mars leading by 69°. Habitat orbital period (686 days) greatly exceeds period of Earth orbit. Thus, clarity requires Earth positions to label with both date and year. 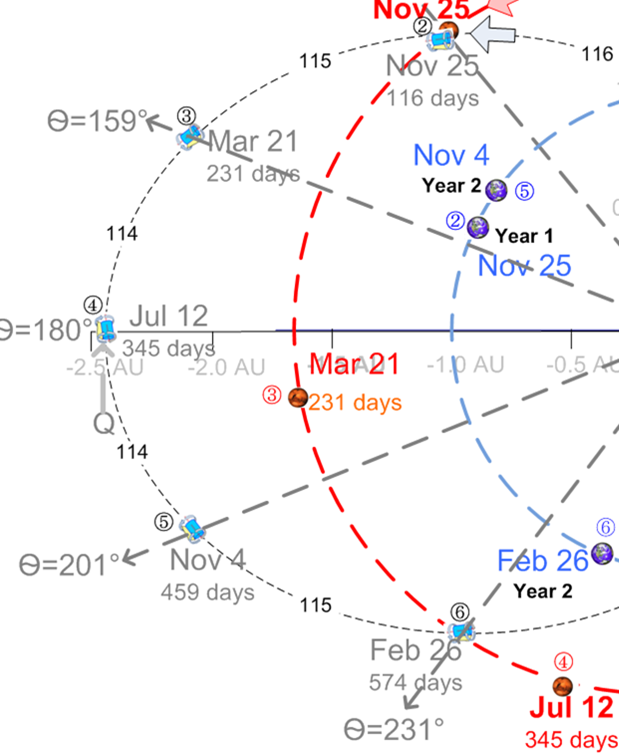 At Mar 22 (Yr2), Earth reaches 2nd possible intercept point. This is over a year (476 days) since the Mars rendezvous.
. Habitat completes an entire orbit in 686 days (Jun 19, Yr2); then, it starts another orbit. Fortunately, Mars once again leads by 69°. Unfortunately, Earth no longer leads by 40°; instead it now lags q by 3°. Thus, habitat's 2nd orbit will likely not intercept Earth in same way. Forty-one days later (Apr 28), Habitat reaches same position. Thus, intercept not accomplished. ① Start 2nd Orbit 686 days after start of first orbit. Earth slips from a lead of 40° to a lag of -3°, but Mars maintains lead of 69°. ② 51 days later, Habitat intercepts orbit of Earth but not Earth. Earth arrives at this point 44 days later. ③ 65 days later, Habitat again transits Mars. 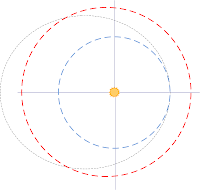 ④ Aphelion, orbit's farthest point from Sol is also orbits slowest point. Positions of Earth/Mars not shown, but be assured they are both far away. ⑤ Habitat approaches Earth, coincidental. ⑥ 2nd Orbit Ends with Earth slipping another 43° behind. We observe a trend of Earth increasing its lag of 43° per orbit; thus, we conclude that this orbit will not facilitate constant rendezvous with Earth. For Habitats to routine travel to/from Earth, humanity must complement above "Marsonance" orbit. Brainstorm produces following ideas; some will be further considered in subsequent chapters. 1. Multiple Marsonance orbits; increase odds of Earth proximity during Earth orbit intercepts. 2. Parking orbits: for some intercepts, Habitat can launch smaller vessel to "park" in slightly smaller/larger orbit which slowly approaches Earth. 3. Multiple Earth Resonant orbits (period is multiple of Earth's orbit, 1 year) to increase odds of Mars proximity during Mars orbit intercepts.